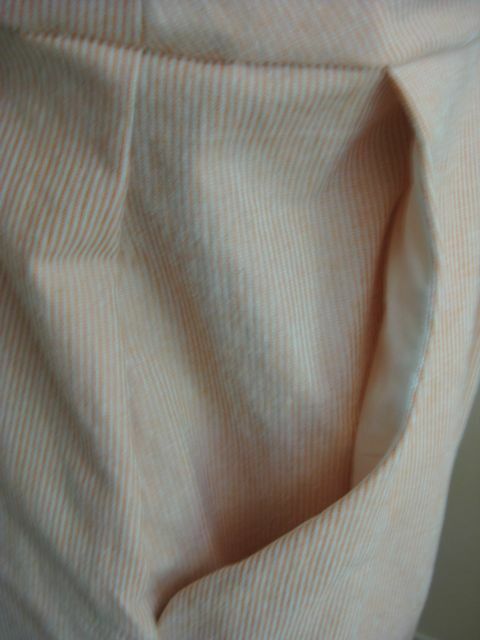 It's this lovely heavy cotton with a thin orange stripe. Think a cross between ticking and seersucker. Bought it from Fabric Mart Fabrics, very cheap! I plan to wear it with a white sweater and an orange watch, or maybe an orange sweater and a white watch, and white penny loafers. And then I will eat a Creamsicle. Very nice…and so appropriate for a creamsicle! I just ordered this fabric on Friday, along with a few others at incredible prices 🙂 It’s great to see a finished product! This is *so* lovely. 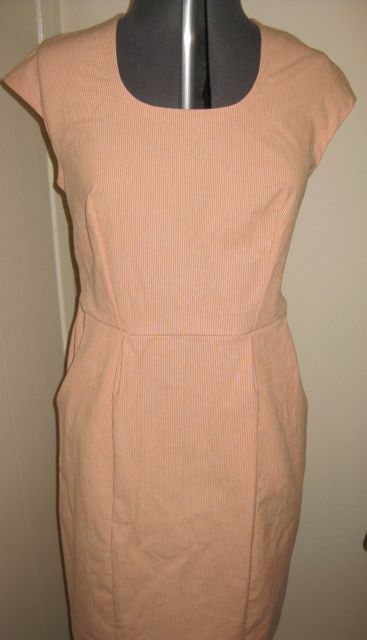 I just adore simple sheath dresses like this. They are called Dreamsicles where I live. And a sharp jolt of black patent leather, on your feet or with a skinny belt, would make the orange-and-white really sing. Lovely, and it appears to be meticulously constructed. ooh i like! can’t wait to see pictures of your reconstruction..actually if you have a post in your archives that is of a reconstruction that would be great to see! i am new to the sewing world and i am loving it! I second (third?) the motion that we get to see some of these dresses being worn! It’s always so much nicer! love the dress and creamsicles. both are so yummy. I love the subtle creamcycle feel of this dress, but I agree with LynnB, you need contrast, not more of the same. Black patent leather or a darker shade of orange for belt and shoes would be a very nice finish. Also, I can’t believe you didn’t do any orange piping! I’m just eating apricot yoghurt and it goes very well together, too. 🙂 Very pretty. Very nice…and so appropriate for a creamsicle!